Sitter: Mary, Viscountess Sidmouth, née Mary Murdoch Johnstone (d. 1983). Biog: Daughter of Sir Donald Campbell Johnstone; m. (1915) Gerald William Addington, 5th Viscount Sidmouth. Occasion: The Court, 24 June 1920: presented by Mrs. J.E.H. Balfour. 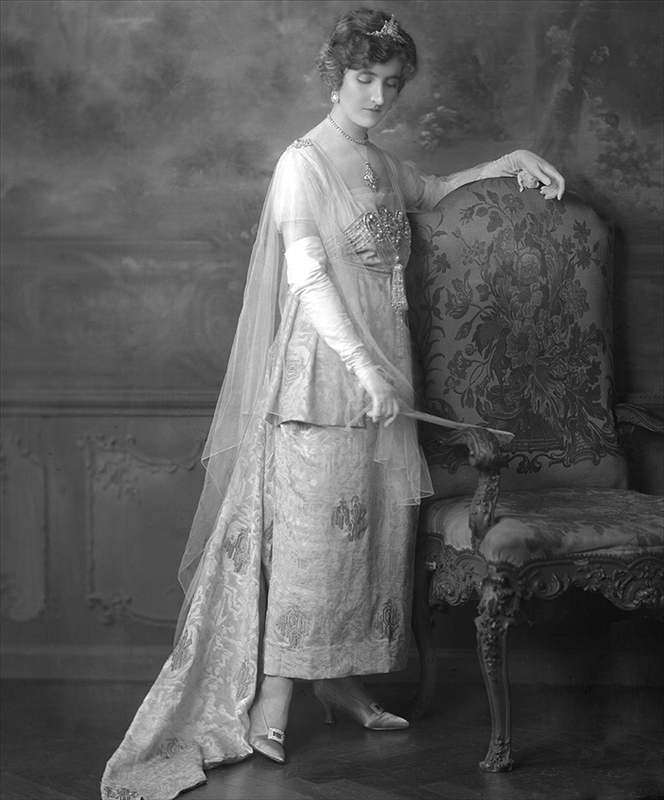 Costume: Court dress: "Gown in soft sky blue and gold brocade with panniers on the hips and an impiecement of diamonds and diamond chains and a diamond tiara" (see: The Times, 25 June 1920, p 20d). Furniture & Props: Painted backdrop; Rococo highbacked armchair. Occasion: The Times, 26 June 1920, p 10c. Costume: The Court Journal, 18 June 1920, p 322a; The Times, 25 June 1920, p 20d. Costume Supplier: The Times, 25 June 1920, p 20d. Reproduced: (version) The Gentlewoman, 10 July 1920, p 49; The Queen, 17 July 1920, front page.